5D Robotics creates Behavior Engine (BE™) software that can give unmanned ground vehicles (UGVs) the ability to perform a variety of actions, from reactive guarded motion, obstacle avoidance, and follow to deliberative behaviors like mapping, localization, waypoint navigation, and path planning. It also allows plug and play of many different sensors. To operate a robot with such varied and complex functions, 5D Robotics was looking for controllers with customizable interfaces that could be used for a variety of military applications. Working with direction from the military customer, 5D selected two different controller types to support on-the-move squad support missions. As one of the selected controllers, the Safe Remote Control System (SRCS) from Humanistic Robotics was put through extensive testing in the field. It proved itself to be portable to different robots, reliable in the field and reusable across multiple missions. In the military there wasn’t a good way to detect explosive hazards for soldiers traveling on foot. The technology that did exist wasn’t something they could carry around on their backs, and they needed a way to off-load some of their equipment. 5D Robotics created a solution. A squad support robot that could keep up with the troops and autonomously follow the squad or go in front of them when there is a detected hazard, minefield, or suspected IED. By having follow and lead capabilities on the robot, testing showed that soldiers should only spend roughly 2% – 10% of their time actually driving the robot. This new approach to robot control is more like interacting with a highly trained police dog than traditional teleoperation. They toyed around with other controllers first. A controller that can handle the tough jobs. When you’re building something for the military to use, you have to be sure it can survive the toughest working conditions. 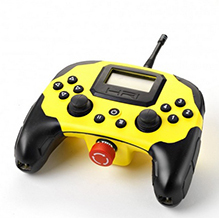 Another important feature when considering a controller for a robot is RF noise or radio frequency issues. This isn’t just important in military applications, but also in commercial applications like mining. The SRCS is designed to allow for operation in these difficult situations. A complicated job. A simple solution. A military application that’s ready for civilian life. 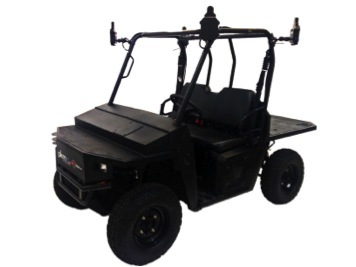 The automated Polaris Ranger developed by PKMM and 5D. To learn more about 5D Robotics, visit 5Drobotics.com. To learn more about Wireless Controls, visit Humanisticrobotics.com. A few words on partnering with Humanistic Robotics.